Sri Lanka was never really on my travel bucket list. I didn't even think about visiting it until one of my university friends travelled there for a psychology placement. I looked at her pictures and thought to myself how amazing the country looked but then we went back to university and Sri Lanka just became another country I wanted to visit. Fast forward to April 2016 when my other university friend Kate, and I were planning our summer travels. We had initially planned to do a road trip through Australia but were becoming less keen on the idea. Partly because we didn't think a two person road trip would be that fun. This in turn led to us brain storming ideas, Kate was keen on South America but we were thinking about visiting Mexico on a separate trip so I said I would rather go somewhere in Asia. The trouble was Kate had done a lot of it. This went on for a week or so until one of us mentioned the idea of going to India. We then did a bit of research and started stalking Instagram for some inspiration. Instagram is usually the starting point of my research into a country as I like to see what's on offer from travellers perspectives rather than a guide book. On my Instagram search I came across a picture from Sri Lanka. Long story short, we decided to incorporate Sri Lanka into our India trip and split the six weeks between the two. While we had overlooked Sri Lanka initially I'm so glad we ended up visiting because it's become one of my favourite countries. After a lot of waffle about how we came to travel to Sri Lanka I thought I'd now tell you everything you need to know about planning a visit! I will do a separate post on sample itineraries but this post will tell you everything else you need to know. Sri Lanka is a South Asian Island located in the India Ocean just under India. While you can fly straight to Sri Lanka from the UK we combined our trip with India and flew from India into Colombo. It's also pretty close to the Maldives, however, this wasn't quite in our budget, if I go to the Maldives I want to do it properly. Plus it was rainy season, no one wants to turn up in paradise and be stuck inside due to the rain! The currency in Sri Lanka is Sri Lankan Rupees. The current exchange rate is around 187 rupees to the pound. Sri Lanka is one of those countries that you could get done in two weeks or 6 months. The island itself isn't very big, especially in comparison to India. We spent three weeks in Sri Lanka. From my research most people spent two to three weeks there. A lot said two weeks was enough but we had time for three weeks and I didn't want to rush. After spending three weeks there I feel like I saw everything I wanted to and had a good mixture of being on the go and relaxing. I would have loved longer to explore more of the 'off the beaten track' parts of Sri Lanka but I feel like this about most places I go to! The basic conclusion is that if you're tight on time you could do Sri Lanka in two weeks, if you're not too constrained by timings then three weeks is plenty of time but if you're on an ongoing backpacking trip with no set dates then don't set a leave date (you'd probably need a longer visa). I applied for my Sri Lankan visa online before my trip. It was straight forward and I received an email with my visa attached. Simply apply for a short stay ETA (electronic travel authority) online. The standard visa allows you to stay in the country for 30 days. The visa costs $35, however, this does vary depending on the website you use. I'd recommend using the Direct Gov website to check for up to date information. The Sri Lanka travel page should include a link to the actual visa website. I always try and use the official website when applying for a visa. There are plenty of other websites that will let you apply but these usually charge more and you never quite know how legitimate they are. I'm going to do a separate post about my route and itinerary but here's the main sights and areas. Sri Lanka could loosely be split into three areas, the Golden triangle, beaches and the hills. The Golden Triangle consists of temples, ancients cities and a very large rock. We did the cultural triangle which is located in the North of the country first before heading through the hills in the middle and down the beaches on the south coast. There are various recommendations for the order to do these in. 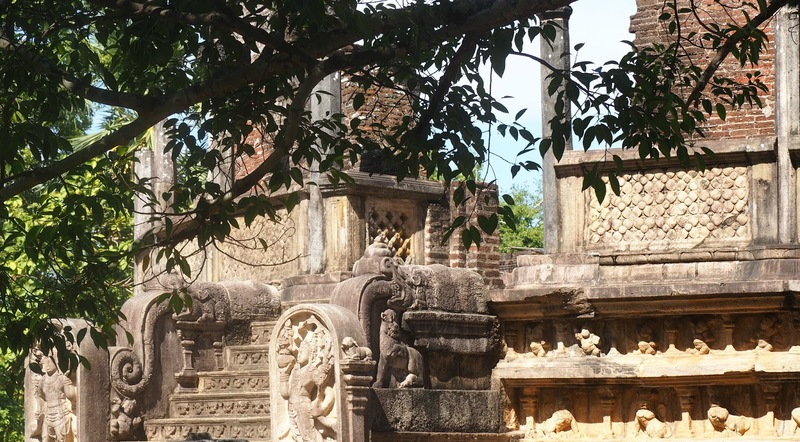 There are also the Anuradhapura ruins. I'm still not quite sure which of the ruins is considered part of the triangle or whether they both are. TIP: Visit Sigiriya Rock from Dambulla. We originally planned on staying in Sigiriya as we weren't sure how easy it would be getting to the rock from elsewhere, however, it was very easy! You can't go to Sri Lanka without experiencing the countryside. I personally believe that anyone visting Sri Lanka should make sure they experience a train journey in Sri Lanka, even it it's just the once. Ella: A very touristy town, most people visit to walk to Ella rock. You can also visit the nine arch bridge from here. Haputale: We visited this small town so that we could walk to Lipton's Seat. A fairly easy hike that takes around an hour and a half. Go early to get a better chance of a clear view. TIP : If you're told the train is sold out (the scenic routes seem to get booked up very early) you can still buy a ticket. It will just be a ticket in a lower class. You won't be guaranteed a seat but you will be able to see the amazing views and may even get the best seat in the house: sitting right by the open doors! There are plenty of beaches in Sri Lanka, the fact that it's an island probably has something to do with that. If you're a beach bum then Sri Lanka is perfect. There are various beaches but most of the main ones are located down South. The best time to visit these beach varies, when I visited in August the weather in the South was quite wet, however, the beaches further up North still had good weather. Arugam Bay: Great for surfers. The sea here is pretty rough so not so great for those who just fancy a paddle. Plenty of nightlife. Mirrissa: Smaller than Arugam Bay. Plenty of nice waterfront restaurants. Tangalle: We chose to skip this beach so we could have more time in Hikkaduwa. Good for a day trip to Galle Fort. Hikkaduwa: Nice beach with temples near by to explore. Also home to the turtle hatchery and tsunami museum and memorial. TIP: If you want to visit Galle Fort but don't want to stay there or in Tangalle then you can easily get a local bus there from Mirrissa. This takes just over an hour. You can catch the bus on the main road in Mirrissa. Just hop on and pay on board! Sri Lanka is home to a number of National Parks that are located around the country. We personally visited Yala national park in the hope of seeing some leopards. Have you been to Sri Lanka? Let me know in what you thought about the country.